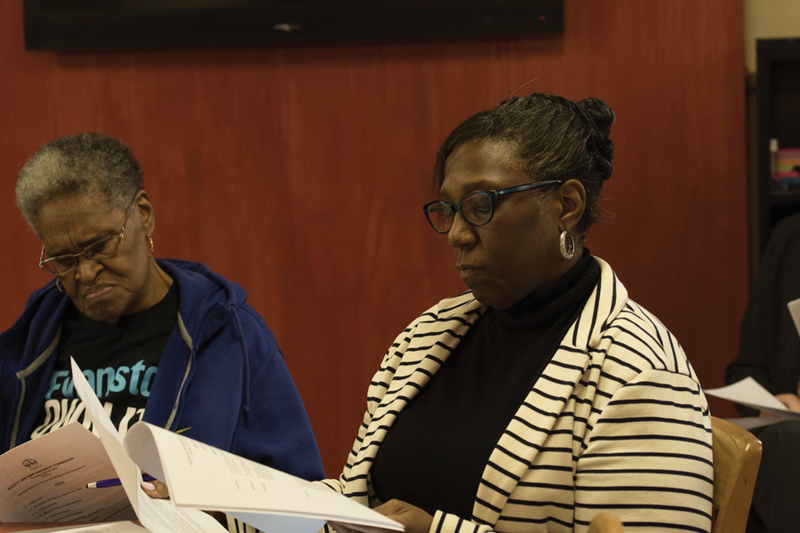 Former 5th Ward alderman Delores Holmes and equity and empowerment coordinator Patricia Efiom attend a Thursday Equity and Empowerment Commission meeting. Members discussed plans for resident input before city staff draft the fiscal year 2019 budget. As Evanston anticipates another multi-million dollar budget deficit in the next calendar year, city staff plans to gather resident input on programs and services ahead of drafting the fiscal year 2019 budget later this year. Speaking at an Equity and Empowerment Commission meeting Thursday, assistant city manager Erika Storlie said the city will encourage residents to fill out a survey about certain programs and services and provide feedback about their needs. The list — which contains roughly 150 separate programs — was compiled in the past six weeks. She said the early start was deliberate and meant to ensure residents all across Evanston get a say in what programs are important to them. The city wants to “put an equity lens on the budget,” she said, and work actively to combat the estimated $3 million to $5 million deficit. Former 5th Ward alderman Delores Holmes, who is a member of the commission, said residents first talked about priority-based budgeting at a ward meeting on April 20, where they were asked to rank a small list of city programs on a scale from one to four based on how well they helped achieve City Council goals. “Everyone has a different values system and different priorities, so I don’t think there’s going to be any easy way to do it, but we all have to start the process and work toward a solution that is best for all of our city,” she said. On Thursday, Efiom and other commission members stressed the importance of reaching out to residents who will be most affected by potential cuts to services. She said demographic data will be collected from all residents who fill out the survey — whether online or in various locations across the city — and allow staff to tailor the final decisions to residents’ needs. Storlie said once the city collects data from residents, they will present it to City Council, who will use it in budget discussions toward the end of the year. “It’s going to be interesting to watch the process and how people take into consideration other people and their needs,” she said.